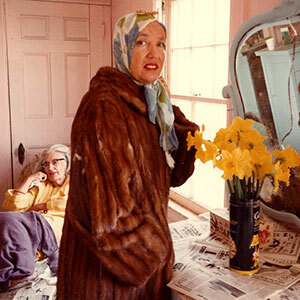 The Grey gardens star has captured the eye of many and caused a cult following. In the documentary observing her life with her mother, you see the cousin of Jackie Onassis living in near destitute in a falling once grand house. The former New york socialite and sought after debutant returned home to live her mother after a failed modeling career and the plights from her brokenhearted mother, Big Edie, and since then she lived in near isolation in Grey Gardens. In the 1975 documentary you can see the strange behavior of the two, you also sense a strange melancholy, regret, missed opportunities but also a kind of inner joy between the bickering pair. Little Edie’s unique style of head scarves, turbans, brooches, big furs and gordy colours has inspired many designers, and she has appeared in Vogue many times posthumously. If you have not yet seen Grey Gardens, get to it!